NuVue Winter WRAPZ 10' X 20' are a Universal High-Tech Synthetic Cover. The WRAPZ are ideal for protecting trees and shrubs from strong winds, snow and road salt. Synthetic material wont rot, mould or mildew and made of a light weight material used by professional growers. The WRAPZ can be used where a framed cover application will not work like lawn furniture or a row of hedges. 12' Winter Wrapz Insulating Winter Garden Wrap for trees and shrubs. Fits trees and shrubs up to 36" x 60"
The Blue Wave Bronze Grade Cover features a rugged polyethylene scrim and coating that allows it to easily withstand the winter's worst weather. UV protected, this cover lasts for years in direct sunlight, and its black underside retards algae growth while heat sealed seams provide crystal clear pool waters for next spring. This Blue Wave cover comes with loops every four feet to secure water bags, and corner grommets that allow for extra tie down in windy areas. It also has a 5 ft. overlap, comes in a Dark Navy Blue with a Black underside, and is backed by an 8-year warranty. The Blue Wave Gold grade cover is constructed of our strongest and most tear resistant material. This cover features rugged U.V. stabilized woven polyethylene that protects it from sun, snow, wind and ice. It features a black underside to retard algae growth and heat sealed seams to ensure a crystal clear pool next spring. The cover features a big 4 foot overlap that means it will fit above ground pools with wider top rails unlike smaller 3 foot overlap covers. This Blue Wave Gold grade cover is held secure by a heavy duty cable and winch tightener that is anchored to the cover by rip proof metal grommets. 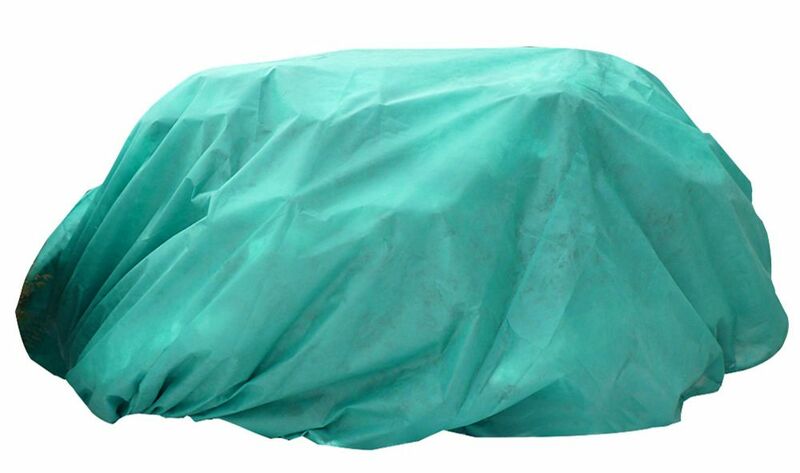 This rugged cover is built to last, backed by a 15 year warranty (3 years full rated). Invest in quality this fall with Blue Wave Gold. This Blue Wave cover comes in royal blue with a black underside. Winter WRAPZ 12 ft. Round Tree and Shrub Cover NuVue Winter WRAPZ 10' X 20' are a Universal High-Tech Synthetic Cover. The WRAPZ are ideal for protecting trees and shrubs from strong winds, snow and road salt. Synthetic material wont rot, mould or mildew and made of a light weight material used by professional growers. The WRAPZ can be used where a framed cover application will not work like lawn furniture or a row of hedges. Winter WRAPZ 12 ft. Round Tree and Shrub Cover is rated 4.0 out of 5 by 3. Rated 3 out of 5 by lp from we have had a hard time keeping the covers on our plants. They do not stay put very well in the ... we have had a hard time keeping the covers on our plants. They do not stay put very well in the wind. Rated 5 out of 5 by Charles from I ordered two of these 12 foot diameter covers, & two 10 foot by 20 foot covers. So far I have on... I ordered two of these 12 foot diameter covers, & two 10 foot by 20 foot covers. So far I have only used one of the 12 foot ones, but will be using the others as Florida Winter weather kicks in. Believe it or not, the Pensacola area can get nights down in the 20s at night, especially in January & February, & my Sago & Fantail palms do not like it that cold, & are expensive to replace. I gave 5 stars, but am anxious to see if they protect against several nights of a hard freeze. They are light weight, & I put the one on that was a windy day, & very hard to control when doing it myself. I recommend having 2 or 3 people to help keep it from blowing away on a windy day, until it can be secured. I like that it does have drawstrings to help hold it in place. I did use a 7 foot long piece of PVC pipe with a cut tennis ball on top (to avoid a puncture), to help hold it up from squishing the palm fronds, I stuck the other end in the ground, & secured it to the trunk with a bungee cord. Rated 4 out of 5 by DLB from Plant frost protection Works as advertised. Draw string attachment is a bit flimsy.